There are some albums that when they are announced make you impatient to hear them. A new album from Mr Big certainly falls into that catgory, so I was very happy when it arrived for review. 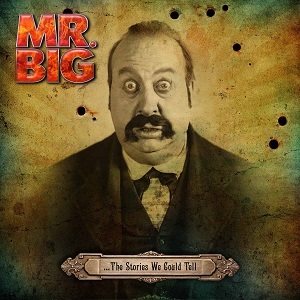 It's the eighth album from Mr Big and comes three years after the release of their last album (What if). Brief comments on some of the tracks.. The album opens with "Gotta love the ride", a great bluesy rock song. "The monster in me" opens with some superb bass playing from Billy Sheehan - the only man I've ever seen in cocnert doing a bass solo that I actually enjoyed hearing - normally the words "bass solo" are enough to send people running to the bar, but Billy Sheehan's bass work is amazingly good, and although the opening here is relatively simple by his standards it's still great to hear it taking centre stage briefly. "East/West" blends acoustic and electric guitar in a track that seems like an obvious candididate to be a single. The electric guitar solo is a nice touch too. On my first listen I enjoyed the album, but it's definitely one of those albums that gets better the more you listen to it. The vocals from Eric Martin are excellent, and the guitar and bass are just superb. The bass from Billy Sheehan is very impressive, although it's easy to overlook on a first listen as you're naturally drawn to the vocals and the superb guitar work from Paul Gilbert. It really is an album that is highly recommended - I'll certainly be buying a copy as this is an album that no self-respecting hard rock fan should be without.